It never hurts to save a little money from time to time. As a person who loves a great deal, especially from my favorite stores, receiving rewards can be a great thing. However, it seems consumers nowadays just want to buy the products or services that they need and get home. I get it. Netflix is calling. 2. Integrate with social media. I’m not trying to put you on blast, but are you always on social media? I know I am. Puppy videos on Instagram just always call my name, ok? I can’t help it. Chances are your customers are like me. In fact, Pew Research Center recently revealed that 68% of adults are on Facebook with nearly 3/4th of them logging on daily. 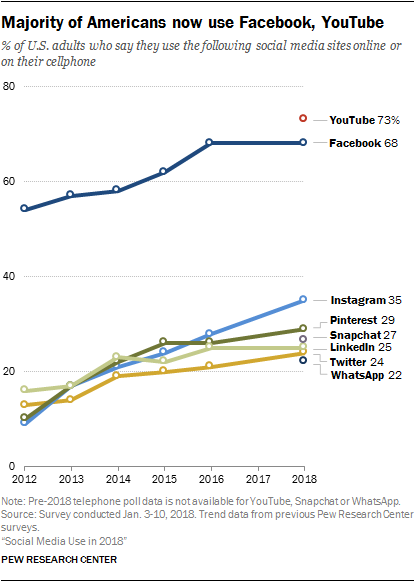 The growth trend for all the other platforms also continues to climb. If your customers are on social media anyway, you might as well give them an incentive to come back to your business, right? Integrating SMS into your social media campaigns is another great way to build up subscribers. Coupons, deals and puppy videos?! Seems pretty great to me. In-store signage is a great way to get customers to sign up for your text marketing campaign. Offer an incentive while they’re are already in your place of business and watch your subscriber list grow. Remember, you don’t always have to give away products or margins to build your list. Try a line like “be the first to hear about our special offers!” or offer double rewards points if you have a rewards program in place. Here’s a good article explaining how to select the right product to offer as an incentive. Emails are a great and effective complimentary service to text marketing campaigns. Use your existing email lists to grow your text marketing lists. Remember that 98% of text messages are read compared to 28% of emails and text messaging has a 45% response rate compared to 6% for emails. Incentivize your email subscribers to receive great deals via text messages and watch your marketing reach grow! 5. Only Send Exclusive Content. Am I a VIP in your eyes? If you think I am, then show me… or rather text me. Let your text subscribers know that they are special. It’s an exclusive club so give them the red carpet treatment. What better way than to reward them with content and offers they can only get via text. I feel special already. While we realize not everyone is always going to take the time to sign up, the key is to make it worth their while for the customers who do. Who knows, maybe they’ll even get their friends or family to sign up. Best of luck growing your text marketing subscriber lists, and happy texting!